Hello again! Today we are going to visit my newest IKEA Expedit Shelf. 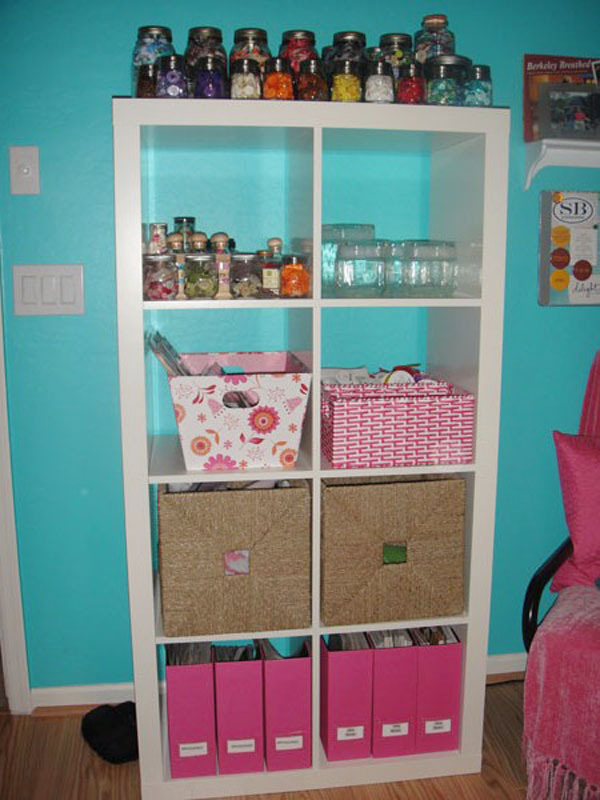 Earlier this year I re-did my space and replaced some very cute but not functional shelves. This time we will go bottom’s up. I pared down my magazine and idea book collection to the 6 pink holders below and one shelf on the long wall (seen in yesterday’s post). I subscribe to several scrapbook magazines and love idea books. But the past issues (from 2002 forward) were taking up several shelves in my closet. I rarely look at them, so I decided to only keep the past year’s worth of issues and idea books I was still inspired by. The old magazines will be bagged up by year for the next LSS yard sale. The magazine holders were from Organize.com, I believe. 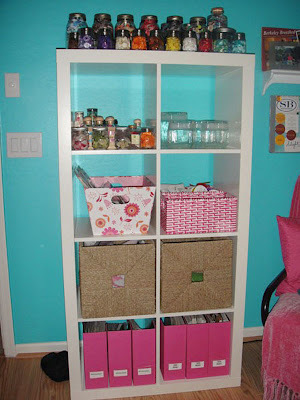 The wicker baskets (from IKEA) will be covered in a future post as they hold Cricut and sewing supplies. The shelves 3rd from the bottom hold my recently in supplies. This is the box where I put my purchases (that are not from kits). This helps me use the new fun things that I discovered in the LSS that excited me enough to buy it. When working on a page that needs something, this is my first go to stash. This is new for me, but as I get less inspired bu something, they rotate to the location that they would normally be located. Earlier this year I got this idea for storing ribbon from Gina Johnson. As you will see in the next picture I should have ribbon covered, but it is an area I still need to spend some time thinning down, but I still can’t help myself from buying new pieces of it. 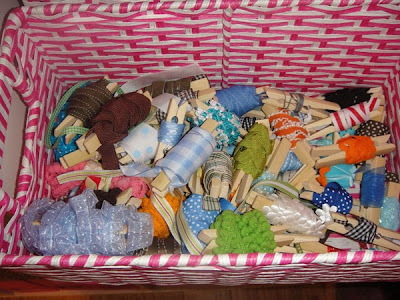 Now pieces that are about a yard or less are wrapped around a clothespin and thrown in this basket. I can rifle through here and find what I like and it is so colorful, it just makes me happy. Both baskets were picked up at Michael’s from the spring baskets bought on sale. I admit I had those Prima milk bottles in every style and color, but I recently got rid of most of them in the LSS yard sale. I only kept ones I deemed usable for me, as well as other pretty jars and bottles I knew I would be likely to use. Currently the shelf next to this one is empty with my former crop sale table display jars. I haven’t figured out what I want to do with those. Lastly, this is my ribbon and button display. 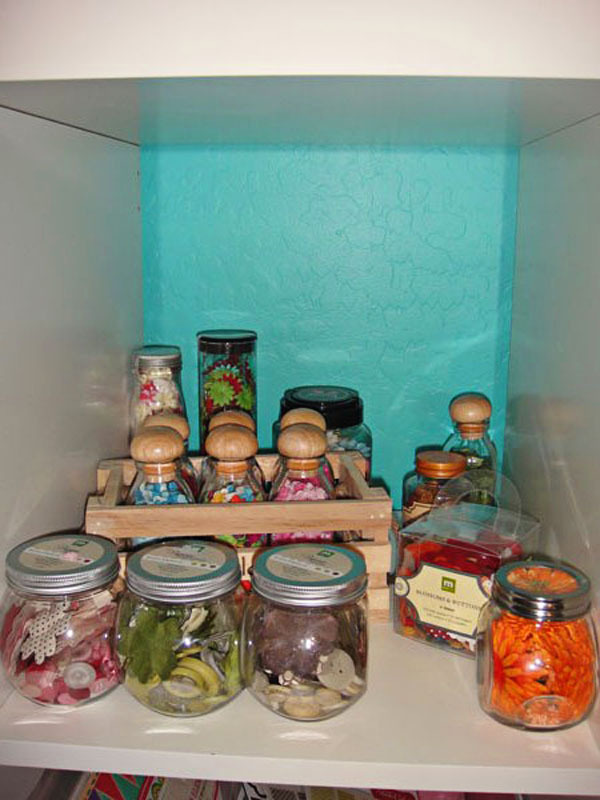 I have stored my ribbon by color in the large canning jars for years. It works nicely for finding ribbon for a certain color, but it is a pain to pull it in and out. On my to do list is to thin those out. I have always stored my buttons in big jars (back right) all mixed up. 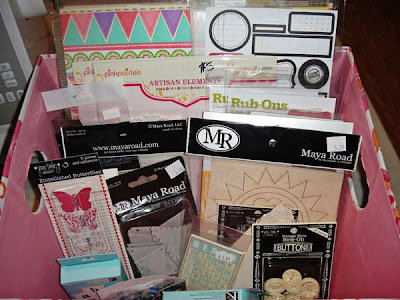 But after closing Color Me Daisy I was still left with a huge button supply we had purchased to match to kits. I also had several jars we used for the embellishment bar we set up at our crop nights. So I took the empty jars and filled them with different colored buttons, and already I like being able to pick out just the colors I want for a page. 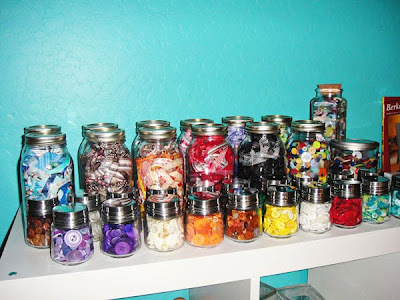 But I have no desire to sort the mixed jars, and I think they serve a purpose too. And all the bright colors on that shelf make me happy! See you tomorrow to talk about wall space!